I worked in the management of huge multinational companies for 25 years. I practiced several sports and had many experiences in my life. I met Koelle in California where she was leading the learning center of Monty Roberts. She introduced me to Geronimo, a mustang, and that was the first step of a long trip that it is still going on. I met up with Koelle again after four years in Italy and she showed me the power of coaching. In 2011, I started my education as a coach and Equus coach. I am certified ACC for International Coaching Federation as an executive and life coach. 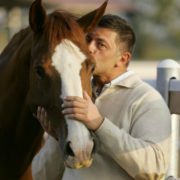 I organize courses and workshops for managers and individuals, together with my horses at my farm on the west side of lake Garda and all over Italy. I love to see the eyes of a coachee finding his/her way. I love to feel the power inside a coachee discovering that he/she owns all the answers he/she needs. I love the moment when a coachee starts to love what is. I love to learn from my coachees. I love to learn from my horses.